In March 1999, Tom Ferguson, a medical doctor and self-care advocate, and Bill Kelly, cofounder of Sapient Health Network, fielded a survey of an online patient community which asked members to rate the most useful resource for twelve dimensions of medical care.14 Online patient groups were rated more useful than health professionals on ten of the twelve aspects of care, such as practical knowledge and help finding other resources, whereas specialists and primary care doctors received higher ratings for diagnosis and managing a condition. It was a small sample of a single patient group (just 191 respondents), but it served as the inspiration for the following series of questions. In our national telephone survey, all adults were asked which group is more helpful when they need certain types of information or support: health professionals like doctors and nurses or peers like fellow patients, friends, and family. Health professionals are the overhwhelming favorites when it comes to getting an accurate medical diagnosis. Fully 91% of U.S. adults say doctors and nurses are more helpful than other sources, such as fellow patients, friends, and family, when they need a diagnosis. Just 5% of adults say they find advice from friends, family, and other sources more helpful. People living with rare conditions often struggle to get a diagnosis. In fact, the National Institutes of Health established the Undiagnosed Diseases Program in order to help patients with rare conditions find answers, with the understanding that the exploration of the edges of medicine can provide insights into more common ailments.15 A diagnosis, however, is just another starting point for most people, especially if they feel more information and advice are needed. Health professionals are the clear favorite when it comes to gathering information about prescription drugs. Fully 85% of adults say they think doctors and nurses are more helpful than peer sources when they need drug recommendations. A recent study by the Pew Internet Project and the California HealthCare Foundation reported that 24% of internet users look online for information about drug safety or recalls.16 Caregivers, women, college graduates, and internet users living with chronic conditions (particularly those with lung conditions) lead all other groups in their interest in drug safety information. Age is also a significant predictor: 29% of Generation X internet users (34-45) say they have done this type of research online, compared with 21% of internet users ages 46-55 years old. When asked who they think is more helpful when they need information about alternative treatments, 63% of adults choose health professionals over other sources. Twenty-four percent of adults say they find the advice of friends, family, and fellow patients more helpful in this case. A 2008 study by the Pew Internet Project and California HealthCare Foundation found that 35% of internet users have looked online for information about alternative treatments.17 Women are significantly more likely than men to look online for alternative treatments and medicines (37%, compared with 31%). In addition, adults over the age of 65 are significantly less likely than younger adults to look up alternative treatments and medicines online. Sixty-two percent of adults say they think health professionals are more helpful than peer sources when it comes to getting a recommendation for a doctor or specialist. Twenty-seven percent of adults prefer to ask friends, family, and fellow patients for this type of advice. Older adults are much more likely than younger ones to say health professionals’ opinions are more helpful: 72% of adults ages 65 and older say this, compared with 56% of 18-29 year-olds, for example. In our previous report about the health topics people search for online, we found that 44% of internet users look online for information about doctors or other health professionals.18 Caregivers, women, those with a college degree, and parents with children living at home lead all other groups in looking online for information about doctors or other health professionals. Half of internet users in each of these groups look online for this type of health information. Generation X internet users (ages 34-45) are the most likely age group to look online for information about health professionals: 51%, compared with 41% of internet users in their 20s and 42% of internet users between 56-64 years old, for example. Health professionals are also preferred by a majority of adults (62%) when it comes to getting a recommendation for a hospital or other medical facility. Twenty-seven percent of adults say they think other sources, such as friends, family, and fellow patients, are more helpful in gathering this type of information. Again, older adults are considerably more likely than younger adults to turn to health professionals for this type of information: 72% of adults ages 65 and older, compared with 54% of 18-29 year-olds. In our previous report about the health topics people study online, we found that 36% of internet users look online for information about hospitals or other medical facilities.19 Caregivers, women, those with a college degree, those between 34-45 years old, and parents with children living at home lead all other groups in looking online for information about this topic. Four in ten internet users in each of these groups look online for information about hospitals or other medical facilities. A clear majority of adults favor friends, family, and fellow patients when they need emotional support in dealing with a health issue: 59% say that, compared with 30% of adults who say they rely on health professionals for such support. Women are more likely than men to say they rely on friends, family, and fellow patients for emotional support (64% vs. 54%). Younger adults are more likely than older adults to turn to friends, family, and fellow patients for emotional support concerning a health issue: 70% of 18-29 year-olds say this, compared with 64% of 30-49 year-olds, 55% of 50-64 year-olds, and 42% of adults ages 65 and older. 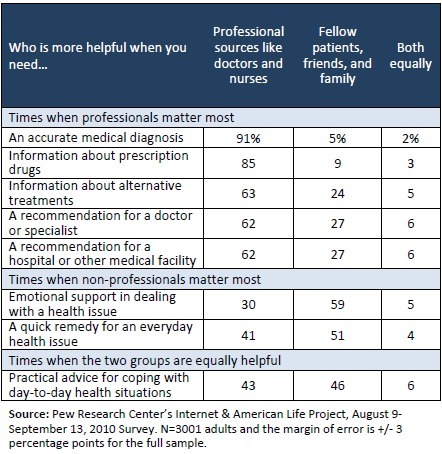 Half of adults (51%) say they find friends, family, and fellow patients more helpful than professional sources when they need a quick remedy for an everyday health issue. Forty-one percent prefer advice from a doctor or nurse. The gender and age breakdowns are similar to the question regarding practical advice for coping with day-to-day health situations: women and younger adults prefer to gather quick remedies from peers while men and older adults prefer professionals. People are split evenly when it comes to day-to-day care tips: 43% of adults say health professionals are more helpful and 46% of adults say friends, family, and fellow patients are the better source. Women are more likely than men to rely on friends, family, and fellow patients for practical advice: 51%, compared with 40%. Older adults are significantly more likely to say health professionals are the more helpful source for coping strategies: 55% of adults ages 65 and older, compared with 45% of 50-64 year-olds, 40% of 30-49 year-olds, and 38% of 18-29 year-olds.